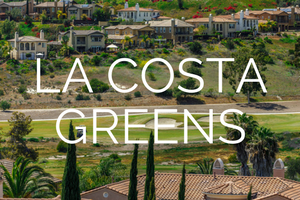 The La Costa Greens neighborhood is a very large collection of 12 communities with detached single family homes. The properties were built between 2002 to 2012 and offer four to six bedroom floor plans that range in size from 1,953 to 5,500 square feet of living space. Some of the features found in these homes can include over-sized three car garages, gourmet kitchens with center island, large master suites with jacuzzi soaking tub and good size backyards. Living in the La Costa Greens community has many benefits that include The Presidio community pool, fitness room, clubhouse and tennis. From this location it’s just minutes to local Carlsbad schools and the beach. There are also walking trails nearby, and close proximity to shopping and golf. The neighborhood is under a homeowners association with monthly dues required.